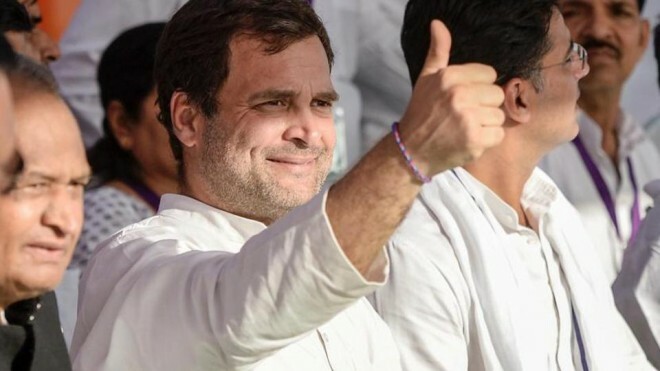 Wayanad, Apr 04: After filling nomination, Congress president Rahul Gandhi said his aim is to send a message that India is one, be it North, South, East or West. He said, "I understand that my brothers and sisters in CPM will now speak against me and attack me, but I am not going to say a word against the CPM in my entire campaign." Rahul Gandhi filed his nomination from the Wayanad Lok Sabha seat on Thursday morning. Priyanka Gandhi Vadra accompanied him during the documentation at the district collectorate. The brother sister duo took a helicopter to fly to Kalpetta in Wayanad. Congress held a road show to mark the beginning of the party president's campaign at Wayanad, Kerala after the nomination. Three journalists sustained minor injuries after a barricade in Rahul Gandhi's roadshow broke. The injured were helped to the ambulance by Rahul Gandhi. The AICC chief, along with the state leaders including former Chief Minister Oommen Chandy and Leader of Opposition in the Kerala Assembly Ramesh Chennithala, came out in an open vehicle after Gandhi completed the nomination procedure at the district collectorate here. As a massive crowd of supporters gathered on both sides of the road, security personnel had a tough time controlling the workers to clear the way for the vehicle. Gandhi and Priyanka, attired in a mustard and red saree, waved to the crowd. As the vehicle inched forward, Gandhi was seen shaking hands with many elated supporters. People were seen clicking photos on their mobile phones and waving flags of the Congress party and its ally Indian Union Muslim League (IUML). Earlier, Gandhi filed nomination before the district collector A R Ajayakumar here. Heavy security was in place in and around the collectorate ahead of the high profile visit of the Congress chief. While leaving the guest house in Kozhikode, the Congress chief and his sister were greeted by a huge crowd. He stopped his car and stepped out to greet party workers, who were standing there for hours. Three-year-old Zoya, who was among the people waiting to get a glimpse of the Gandhi siblings, was greeted by Rahul. "We were waiting since 8 am. Last night also we waited so long, but couldn't meet him. We are so happy that we could meet him," Zoya's mother told reporters. Rahul also shook hands with some party workers before he moved on. He later flew to Nagpur in Maharashtra to address a rally.